Before I get flooded with complaints, I guess this is more of a slice than a brownie, but it is healthy and filling. It has no sugars, no gluten, no grains, it’s low carb and incredibly easy to make. 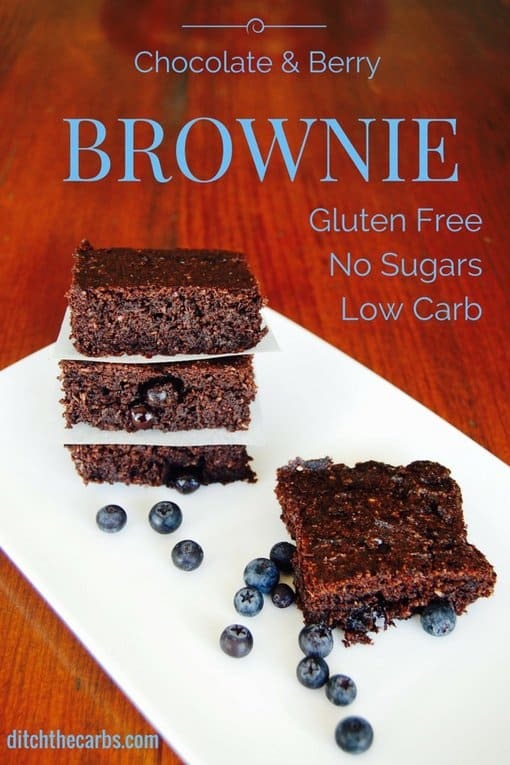 So call it what you will, low carb chocolate berry brownie is delicious. The definition of a chocolate brownie is “a flat baked dessert square” but over time most people think of a square slice that is crunchy on the outside (like a biscuit) and soft on the inside (like a cake) and possibly with chocolate chips and nuts. This low carb chocolate brownie goes back to the original flat baked dessert idea. Brownies are typically eaten with cream, and personally, I think they are best eaten with berries on the side. They are sturdy enough to handle the school lunchbox (if you are allowed to bring almonds to school). They can be frozen and are an excellent stand by in a cake emergency (ever have those?). 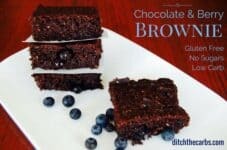 Low carb chocolate berry brownie is light and crumbly with berries hidden inside to make it sweet and delicious. Mix the butter and sweetener together until pale. Add all the other ingredients except the berries. Mix well. Fold in the berries and pour the brownie mixture into a lined 20cm/8 inch square baking dish. Bake at 180C/350F for 15-20 minutes or until the centre is cooked. 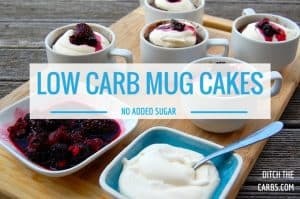 With ALL low carb baking please taste the mixture BEFORE baking and adjust the sweetness accordingly. 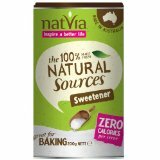 Those of you who have only been sugar free for a little while, may require more sweetener than those of us who have been sugar free for some time. If a recipe turns out to be not sweet enough for you, you can always save it by serving with sweetened whipped cream. 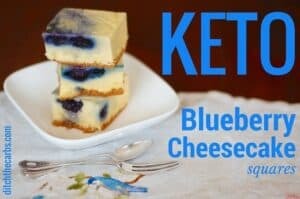 This was my first time trying a Keto bake – I used Stevia and added little dark chocolate chunks – these are fabulous – thank you for bringing cake/brownies back into my new Keto way of life!!! Hi, can i use coconut oil instead of butter?! Do we have to use the shredded coconut? 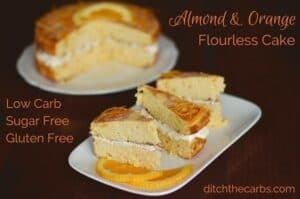 Can I use regular flour instead of almond flour for this recipe? thank you! No, because regular wheat flour works in a completely different way, and wheat flour would no longer be low-carb. You may wish to read “Why we are grain free”. I have made sugar-full brownies for years and always had rave reviews. Today I took your low-carb version to work and to my amazement was told by sugar-eaters that it was even better than the my trusty old fave!! I only had a few frozen mixed berries so used those plus a small handful of sugar-free dark chocolate chips. The texture was soft but held together – just right for a brownie. The taste was rich rather than too sweet, and the berries lent a marvellous tart pop of contrast. This is definitely going on my make-again list! Awesome! Yeah I wish I could upload images in the comments section, but always feel free to post them onto my Facebook page. BEWARE USE STEVIA AND NOT Erythritol! I am new to Keto and I was so thrilled to try this considering I had all the ingredients at home. I even have Stevia but had heard great things about Erythritol so I picked up some of that and thought I’d use it for the first time. 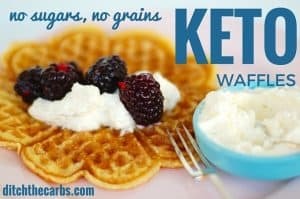 This will almost double the amount of carbs per serving! I didn’t realize Erythritol had 4 carbs per 4 grams.. this recipe calls for 4tbsp’s which is close to 50grams of Erythritol. I didn’t even use the berries or coconut and per serving each brownie is 6+grams of carbs not the 2g net carbs listed above for those using Stevia. I will say, I had zero problems with them falling a part but I used a muffin tin and made brownie muffins. Came out perfect. Checked it at 12 minutes and it didn’t pass the fork test, tried again at 15 minutes and they were good to go. They are delicious with some whole cream. Also if you do the 6muffin tin, you have to count for twice the amount of carbs so there’s a trade off. 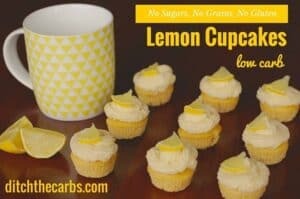 I’ll be making these again with Stevia so this won’t matter as much! Thanks for the recipe! All the carbs from erythritol are absorbed then excreted unchanged so do not count towards your carb count. Erythritol does not raise blood sugars. What are the measurements using cups, etc??? I do not know how to do grams. Thank you. I just made these today, and they taste great, but for some reason, they kind of fall apart 🙁 I had to leave them in the oven for about 25min, because they weren’t done by 20min, but other than that, I think I followed the recipe. Do you know what could have gone wrong? Hmm, the eggs and almond flour should have been enough to hold them together. Next time, I would try and press them firmly into the baking dish to make them a little firmer perhaps. Can we make this without fruit? And would this change the nutritional facts at the end. I don’t have any chocolate chips to replace it with. Yes you can omit the fruit, that would lower the carb count. You could also replace it with walnuts or macadamias. That would be lovely. I made these today and they turned out great! I made a couple of substitutions: I used erythritol instead of stevia (I can’t do the aftertaste of stevia) and raspberries instead of blueberries. They were fudgey-chocolately deliciousness! Definitely satisfied my sweet tooth! Brilliant! I am so glad you made substitutions that you know work for you. Thanks for the lovely comment today. I’m sure they will turn out just fine with chocolate chips (unsweetened or sugar free) instead of berries. That would be a great adaptation. Tell her to love cooking and making up her own recipes, it’s a fabulous way to learn. 🙂 I love seeing kids cook. Being in UK the whole cups/oz thing was too confusing, but I prefer to do things by eye rather than by scales anyway. I went with zero sweetener. I bought a jar of Stevia a while back and I hated the aftertaste on another recipe, so I figured I’d just see how bitter things were without it and adjust on future bakes. I used blueberries, halved and folded in, and served with unsweetened whipped cream and a few more blueberries on top, which was enough sweetness to take the bitter edge off the brownie. Will definitely make again, ty for the recipe. I made the brownie and tasted it before putting it in the oven but it is terribly bitter, not sure if I don’t like the taste of vanilla extract or it is just too “sugar free” for me. I used unsweeted cocoa powder and the powdered stevia which is eas disgustogn 🙁 Had to add coconut sugar, more rasberries and dark chocolate chips . It looks pretty, now I am waiting for it to cook. Hope it comes out good. Did you add enough cocoa powder? Some brands aren’t as strong tasting as others, and avoid any drinking cocoa, it doesn’t impart that strong chocolate flavour you ned in the recipe. I always advise to taste baking before cooking it so you can adjust it to your taste. You can always serve with whipped cream you have added cocoa and sweetener. Libby I just want to thank you so much! I am on week three of LCHF and I have been addicted to your website, it’s amazing. I am feeling so much better and have lost 5kgs. These brownies are the perfect chocolate fix, they are delicious. My three year old and I love them! I have also made the lemon cheesecake which was fab too, and plenty of the yummy meals on here for dinner and lunch. Thank you once again, you must put so much work into this and I wanted you to know it’s much appreciated. Thank you Kylie for taking the time to leave a wonderful and thankful reply today. It really makes my day. I am so glad you found my website and are enjoying discovering new recipes for the entire family. Libby. So these need to be refrigerated? That would probably be safest. P.s. I dislike the texture of coconut so leave it out. I wasn’t sure if I would need to change the amount of almond flour to compensate – but it would appear not. Yay Helen. I am so glad when someone new discovers my site and my recipes help you. And what a star to recommend my site to your friends. Thank you, Libby. Everyone loved the brownies. I really love adding in the berries. I splurged and added whipping cream. Love the texture of this. I was feeling lazy so didn’t whip the butter and it turned out beautifully and not crumbly at all. Thanks! looks amazing 🙂 could I use coconut flour instead of almond flour? Sorry no. 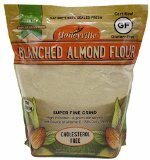 Coconut flour and almond flour are completely different. You also require different quantities of each when baking. Coconut flour is incredibly absorbent and so only use a small amount in baking, almond flour/meal adds bulk, texture and flavour. If you would like some nut free recipes take a look at my waffles, cheesecake squares, pizza waffles or brownie. I am developing more nut free recipe from an allergy and cost perspective so stay tuned. Hi, I just made these tonight – they were pretty nice but they were quite dry/crumbly, so I just wondered, is that normal or did I go wrong somewhere, or maybe cooked them for too long? It sounds like they were cooked for maybe too long. You can always rescue them with whipped cream and more berries. i’d like to ship these. is refrigeration a must, if over-nighted? Love your recipes, but I have problems trying to convert ounces to measurement of teaspoons, tablespoons, and cup fractions. Like the cocoa powder and almond flour in this recipe. Thanks for all your work on this site! I have asked my readers many many times on this subject. Cooking by weight is far more accurate and most people seem to have electric scales, zero in between each addition then add the next ingredient. You can pick them up for under $20 and is well worth it. Measuring items such as cream cheese, butter and other solids is almost impossible by using volume measures of cups, so baking by weight is easier. Click here for some conversion tables. Thank you so much for your reply. Your recipes are so great! I have a question, I’ve been doing the Diet for about 3 works and can’t get it going. Can you tell me if Advocare Spark is ok? Once a day I drink one, instead of coffee. It’s sugar free and only 4 carbs. That’s the only thing I can think of that’s hampering my diet. I know I should stop it for a few days and find out, but literally get massive headaches when I do. So how do you know if a food/drink is acceptable if not on your list? How many sugar alcohols am I supposed to avoid? Confused. I think you may have already answered your own question – if something is stalling your weight loss and you get headaches when you try and remove it, then it’s time to wean yourself off it 🙁 Try to avoid sugar alcohols and sweeteners on a regular basis. Part of the ethos of going low carb is to reduce our sweet tooth and stop us relying on sweet treats. 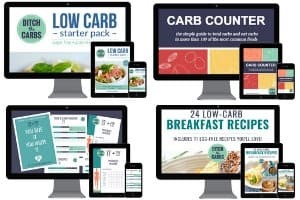 I do low carb baking and they do contain stevia, but I always advise to base your eating on savoury items and only use low carb baking and sweet treats as an occasional food. I know it’s confusing at the start, but just try and remember to eat real whole foods, cut back on most things sweet and keep it simple. Join me on Facebook where you can ask questions also and get tips from readers. Good luck Sandi, you’re doing a great job already. Libby. Thanks again. 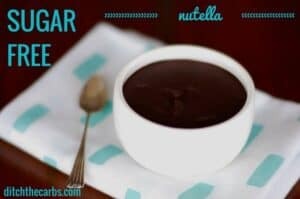 I made your Nutella at the weekend. It was very rich for my children who are not quite sugar free so we lightened it by mixing in some Philadelohia cheese and they adored it. Your recipes are wonderful – accessible and tasty. This will be one for this weekend! Do you do you use cocoa powder or cacao powder for this recipe? There is confusion between the two as some companies use both terms interchangeably. I just use regular unsweetened dark cocoa powder. This looks and sounds divine – I’ll definitely have to try this one.